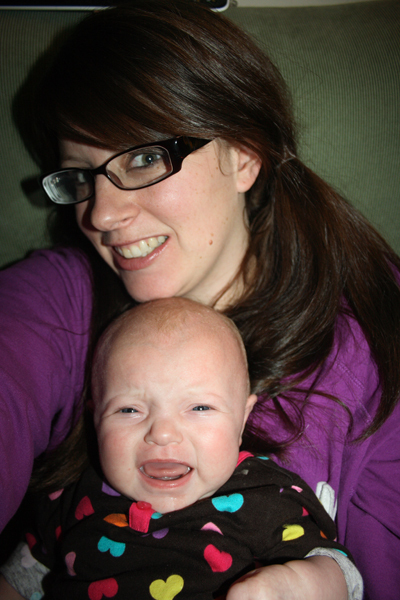 Sweet Baby Mallory: Some days you just need to cry. Some days you just need to cry. I hit my emotional breakdown point yesterday, yep the one where you throw all of your extra baggage on the parking attendant of the Children's Hospital. That poor, poor man. 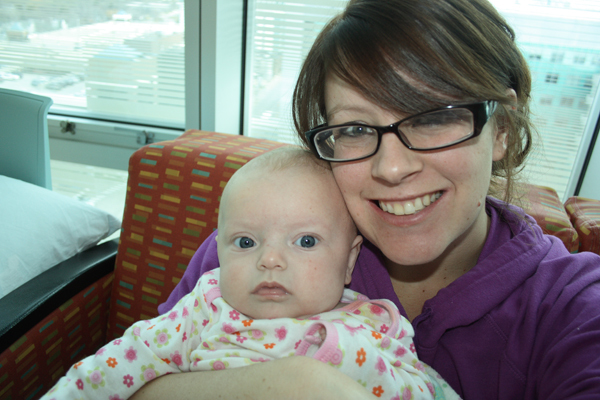 I spent a few hours in the ER with Mallory yesterday, they couldn't give me any answers as to why she will not sleep. There is nothing else they can give her to make her feel better, sleep better, or to get her back to her happy self. She's gaining weight, slowly, but gaining so there are no answers to why she won't eat more and there is nothing I can. As a Mom this makes you feel like dirt, complete crap, and it just isn't fair that my baby has to go through this. What I am feeling is normal, the way I feel is OK. I've come to terms with that. 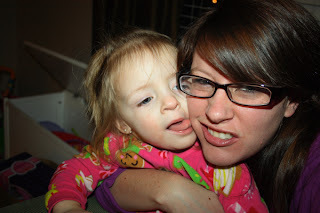 I've realized I am not SUPER Mom, I cannot do this alone, and I have asked for help. I need help. I have a history of depression and it's just seeping through my veins now, I am stuck. I have wonderful parents who have stuck by me in every possible situation in life. Even myself being a naughty kid who banged her head on everything as a child (yep that's why I have a scar across my forehead), pushing my brother around, and I was defiant teenager (ohhhhh my the things they never knew)! 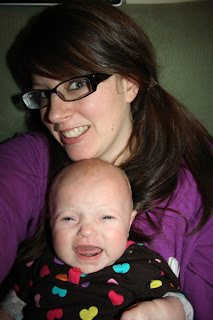 Through Jillian's colic, teething, and eye doctor apts and surgery. Now through this with Mallory, There are NO WORDS that even come close to describing how THANKFUL I am for them. Without them I would have walked away, I would be curled up in a ball crying my eyes out in a corner on a daily basis, without them I wouldn't be who I am today. And I am forever grateful for them. I am so in love with my silly girls. They are what keeps me going. So this is just what life is going to be life for awhile, I've accepted that. I just have to get through it, just a few more months Ash, just a few more months. When I'm having a really rough time I try to remember my Grammy singing "Que sera, sera." It reminds me that though we can't change some things in life we can try our best to accept it. I think YOU are doing an AMAZING job and are a perfect example of this! You may not always feel strong but you ARE! Sending my love and prayers (everyday). Rory prays for Mallory in every one of her prayers. I hope better days are soon to come. Okies U made me cry...I am close enough to u to walk..I am there when ever u need me..even when u dont need me call and ill come over :) The things i could add to this blog of u growing up..but ill be a good mom!! LOL I am very proud of u both!!!!! Ashley, your posts are so honest and real, they bring tears to my eyes, yet also big smiles. 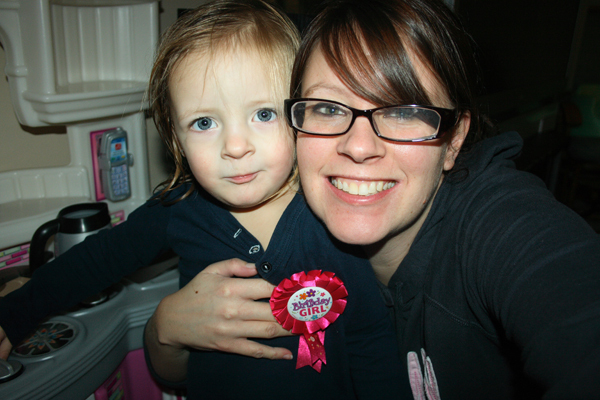 You say you aren't SUPERMOM, what????? You are BEYOND SUPERMOM. You are an absolutely amazing mom, not to mention an amazing person. I know it's now what you want to think right now, but your posts, and Mallory and her story inspire people from all over and everywhere. When my mom got cancer, and I had to live through that with her, I was often so very confused, frustrated, and had lots of questions. I'm a christian, and I still don't have the answers to why cancer, sickness, and suffering are allowed. I have struggled with that, and to be honest, at times still do. I just live with what my pastor and other great people have said, God has his plans, uses people in all ways, and the answers to the hard questions we have are beyond our understanding but God will reveal it all to us. We have to keep our faith, even when things don't make sense, hardships endure, all of it. I can understand the depression part as well. I went through all that when my mom was sick, an end of a horrible breakup with a boyfriend, family issues, friends who weren't really friends, job troubles, it was like God, why am I going through all this???? I had a hard time with getting help with my depression, because it was something my family just didn't talk about. I got involved with a supportive share group at my church, and I was surrounded by people who truly understood what I was going through. That was a tremendous help. While it didn't solve my problems, necessarily, it kept me sane and a little bit more at peace. Please realize that you are okay to feel sad, depressed, and at times angry--you are human and have a lot in your life . You have so much going on in your life, but at the same time you are so so so blessed with a beautiful family. I do not have children, for it never happened for me, and I look at your family and think, Ashley is so blessed. Mallory and Jillian are absolutely gorgeous and they have so much love, so so so much. Keep up the prayers, as hard as it gets, and believe me, there were times I was like, whatever when people told me to keep up the prayers, but it was all I had, and keep posting about your beautiful family. You have a friend from Florida who is praying for Mallory, you, and your family and who has you in my thoughts.